Cyn Shea's Café is conveniently located downtown, just blocks from major hotels; we have a seating capacity of up to 120. Cyn Shea’s offers three distinct private dining experiences. For intimate events of less than 40 guests, we suggest the Garden Room, which embodies the unique charm found only in the South’s most beautiful gardens. 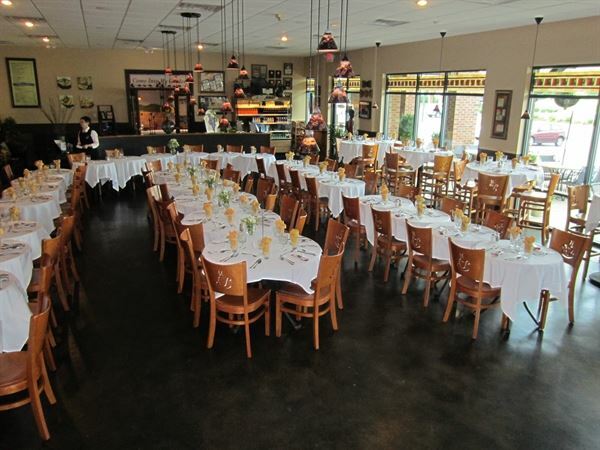 If you need a larger space for up to 100 seated guests, the Main Dining Room provides a cozy intimate experience for your next corporate event, rehearsal dinner, wedding reception, birthday party, or any other event after 5 PM. Renting the Full Restaurant includes the Main Dining & Garden rooms, enabling you to plan events for up to 150 guests after 5 PM. Our private dining experience features two leather-wrapped fireplaces, sofas & seating area as well as Garden Patio Dining and a Live Music Stage Area with Sound Equipment. Venue rental includes: - Plates and Linen Table Clothes - Self-Serve Soda Machine - Fresh Brewed Ice Tea & Coffee - Multi-Media Projector and Fully retractable 106” Screen - Wireless Internet - Professional Bartender. Rates: $1000 Friday/Saturday, 6:00 p.m. – 10:00 p.m. Discounts available when catering with us.